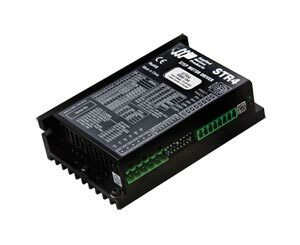 The STR series stepper drive is a compact, powerful, digital step and direction drive available in three power ranges: 2 A/phase, 4 A/phase and 8 A/phase. The STR series is ideal for applications requiring basic step and direction control of a 2-phase step motor. STR drives feature advanced microstepping performance and sophisticated current control with anti-resonance. Anti-resonance electronically damps motor and system resonances, which improves motor smoothness and torque over a wide speed range. All setup is done via dip switches and a rotary switch on the side of the drive, including motor selection, running current, idle current, and step resolution. STR drives are available with a large family of compatible 2-phase step motors, selected to optimize performance of both the drive and motor. NOTE: These drives require step pulses from a PLC or other controller. Control Inputs: Step, direction, enable, optically isolated; 4 to 30 Vdc, 5 to 15 mA.